Boy, it still feels weird that Brian Michael Bendis isn’t at Marvel anymore. Like the dude or hate him—and there is plenty of material to support either decision—he WAS Marvel for, like, fifteen years. And now he’s on the other side of the tracks. Wild. I met Bendis at a Con waaaay back when Ultimate Spider-Man was less than a dozen issues in, and he seemed a pretty cool guy even as a friend of mine chided him for making Ultimate Green Goblin a hulking, grunting monstrosity. Back then, he had no line of fans to speak of, and we got to just shoot with him for several minutes. Hard to imagine seeing Bendis at a convention with no crowd nowadays. It felt like he wrote one out of every three books Marvel published for a while there. Bendis did, in fact, do a lot of work at the House of Ideas for all those years, so let’s take a look at one of his productions. Protagonists: A lot of the basic Marvel heroes, primarily Wolverine and Invisible Woman, but Hawkeye and Spider-Man and Captain America and others all play noteworthy roles. Antagonists: Ultron. Morgana Le Fey. It is a ballsy creative choice to call your mini-series “Age of [character]” and then include the title character… virtually not at all. Ultron himself does not appear until the last issue of the book, and even then, it’s a historical version of the metal fiend, not the one currently ruling his very own age. 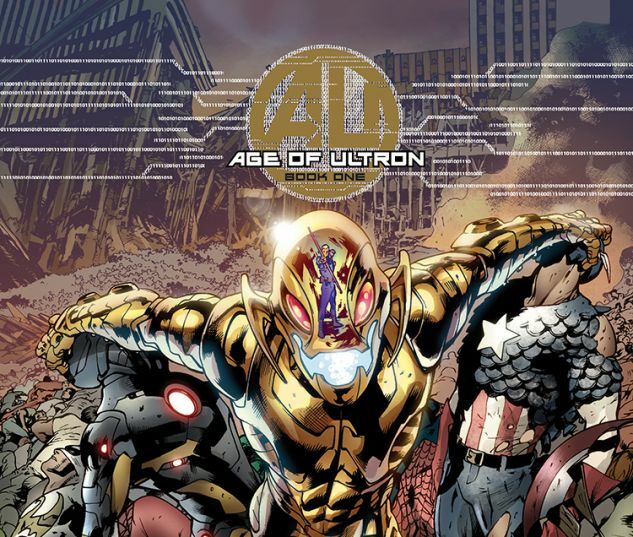 Age of Ultron takes place in one of the many, Many, MANY possible dystopian Marvel futures, and in this one, Ultron has risen to power, driven Earth’s heroes into hiding, and rules Earth with an iron fist (not… not like with Danny Rand. Like a metaphorical iron fist). The series opens with Hawkeye saving Spider-Man from being held captive by The Owl’s henchman shortly before they could auction the webbed off to Ultron. Upon arriving back at the heroes’ hideout, we are given a glimpse of how paranoid and hopeless the good guys have become as they berate Hawkeye for leaving their hidey hole, even if it was to save their friend, and diligently scan them before letting them re-enter. With the news that Ultron is bartering relative freedom in exchange for heroes, a previously despondent Captain America finally rises to his feet with a plan to free the world from the robotic overlord’s clutches. If I wanted to explain to a fan the idea of “Good Bendis” vs “Bad Bendis”, Age of Ultron would be a good title to show them because you get a bit of both here. The first few issues gives us the Good: a gathering of heroes with some fun dialogue and distinctive voices as they unite to fight back. There’s action, make no mistake, but there’s a lot of inter-personal dynamics here, as well. From Spider-Man’s explanation of how he slept through Ultron’s rise and that was the most “him” thing ever to do, to a mostly-broken Iron Man cracking up to himself as he recalls how he and other big brains helped rebuild Vision and no one ever doubted the android Avenger’s allegiance there is a lot of smart, snappy dialogue and characters having personal stakes and emotions… that’s good Bendis! The series turns, however, and around issue 6-7, we start getting Bad Bendis. Everything just gets too “big” and too convoluted, and whacky ideas are pulled out of the rear-end just to see what sticks. To me, Bendis should never have been a BIG STORY guy. He thrived with his runs on Jessica Jones or Ultimate Spider-Man or Daredevil where he struck close to the street and didn’t have a dozen characters in universe-busting circumstances and plots coming out of nowhere. The heroes’ plan to stop Ultron involves time travel, and for Wolverine, that means a chance to sneak away from the herd and travel back to the invention of the robot so that he can stop Hank Pym by any means necessary. Sue Storm follows him, but she is ultimately not able (or rather, willing) to stop Wolverine, so Pym meets a gruesome end. Even to that point, everything is nifty. But when Sue and Wolverine go back to their time, Bendis just gets too zany. The world they return to is now flooded with Skrulls and wreckage from the Kree/Skrull war having made its way to Earth. Marvel’s heroes are now a unified team under a somewhat totalitarian Iron Man regime and stuck in perpetual battle with Morgana Le Fey’s forces, to boot. 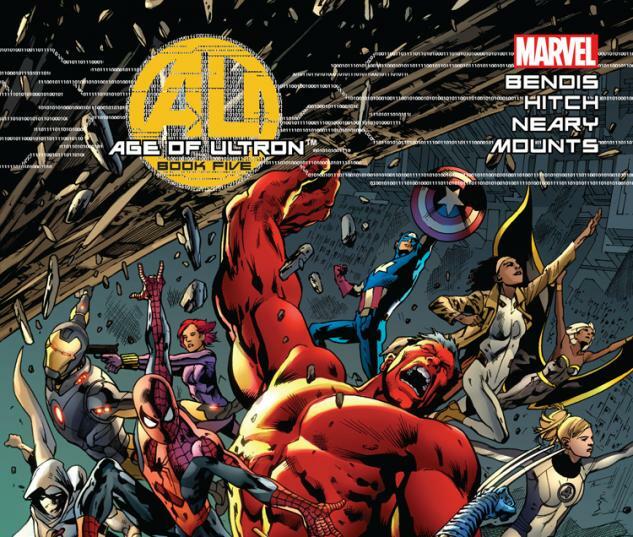 That’s just… too much going on at once and a bit out of left field for a book about friggin’ ULTRON. We get the typical lessons about time travel and butterfly effects, and despite the warnings, Wolverine and Sue go BACK back in time to stop themselves from stopping Hank Pym, and… it all just falls apart for me. This story about an alternate universe cowed by Ultron becomes a silly Marvel retread of a terrible Ashton Kutcher flick. I don’t know… I thought it was a terrible movie anyway. It somehow merited a sequel or two, though, didn’t it? So maybe what do I know? So ultimately, Age of Ultron is a tale of two parts. You have basically six issues or so that are fun while also carrying heavy circumstances and high stakes, and then you have about three or four issues of everything soaring off of the rails into a glorious demolition derby. Make of it what you will, but it really feels like Bendis had a good idea in mind, but then realized he had no idea how to resolve it. Talking Point: Man, how many ways is the Marvel Universe ultimately supposed to end? How many near misses have they avoided already? Ever since Days of Future Past, it seems like a new nightmare future scenario comes about every year. So that said… of all the standing Marvel villains who don’t have a doomsday scenario, who would you like to see one for? A reality where Boomerang conquers the globe? Or where Sauron eradicates mankind? Someone else (probably…)? How would you have them do it? When the worms turns on Age of Ultron, it turns HARD. It’s a shame because the journey is fun for a while, but then it just all goes so hairy. Read up to the point where Logan kills Pym and just assume that the day is saved from there. Wanna Read more on this series?